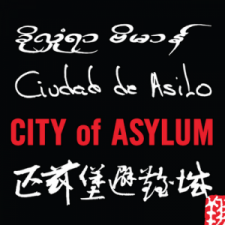 Translated from Spanish by Katherine Wingfield-Dobbs. I attended the first defense hearing against students of the National Autonomous University of Honduras (UNAH) on June 16, 2017 alongside a lawyer, another human rights defender and the student whose turn it was to be subjected to a hearing for having participated in the taking of a building, on May 24. The hall where the hearing took place was laid out so that it resembled the Holy Inquisition tribunals of medieval times – established by the Catholic Church to torture people who did not agree with, or who questioned, the dogmas of the church. 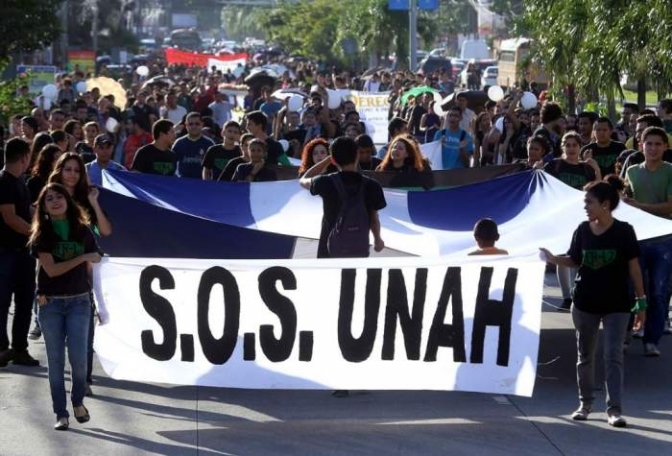 19 students took over the administrative building of the UNAH on 24 May, in protest because a conviction against their companions, Moisés Cáceres, Cesario Padilla and Sergio Ulloa, was approaching. In fact, this took place the previous June 7 when the Fourth Chamber of the Trial Court of the Supreme Court of Justice sentenced them for usurpation against the University during a series of protests that took place in 2015. The judgment sparked more protests and is considered arbitrary by various national and international organizations, and has led to more student protests as they point out that it violated agreements signed last year, when around 75 young people underwent criminal proceedings for exercising their right to demonstrate. There are now 26 students with new judicial proceedings: 25 in Tegucigalpa, one in San Pedro Sula, as well as a journalist who the UNAH accused as a student ignoring the fact that he was undertaking his work as a journalist and that his detention and torture were exactly the documented abuses that 19 students were suffering last May 24. Returning to the comparison of this repressive process against students with such similarity to the tribunals of the Holy Inquisition, a tense atmosphere was felt in the room of the hearing in which I participated and a condemnatory decision was issued against the 19 students that will cause mass expulsions and will violate the right to education and to peaceful protest, as happened in 2014 when the three students condemned by the Trial Court’s ruling and three more, were expelled and then returned to classes because the Constitutional Chamber ruled in favor of their appeal in February 2015. You could see the figure of Rector Julieta Castellanos in that makeshift courtroom, watched by security guards from the Spanish private security firm, Aguán, who maintain an atmosphere of terror in the UNAH, with surveillance, monitoring and various abuses reported by students. It is worrying, as it forms a circle of power for fighting ideas with jail and administrative repression. I took part in the hearing against the last six students arrested in Tegucigalpa on June 16 this year, although the defense for the young people reported to Judge number 16 that the public prosecutor’s office did not have the authorization for the indictment needed to initiate criminal proceedings for the crime of Usurpation, which should have been signed by Rector Castellanos – but I am sure that detail was forgotten by them – nor the complaint by employees of the UNAH whose names were presented as victims of unjust imprisonment, a crime linked to the petition. All that violates due process, but the judge was deaf to it and admitted the petition. The UNAH has become the benchmark for repression in Honduras – it is a mirror of what happens in the country: there everything takes place. The violations reach unimaginable conclusions. The consequences can be fatal, such as what happened in Ayotzinapa, if they are not stopped in time and they do not punish the perpetrators. The student movement proposes to reinstate a Mediator who proposed a negotiated conflict resolution mechanism, while Rector Julieta Castellanos is interested in keeping things the same – marathon appearances in the media in order to sow a campaign of hate against students who tell all. Invitations to these programs are are only extended to journalists who tow the Government line of promoting the human rights violations by positioning them as the fight against violence. Alongside this crisis, the election year advances with the proposed reelection of the President Juan Orlando Hernández, who has supported the repressive actions in the UNAH. The question is this: will arbitrariness and oppression prevail against social protest and the right to education?